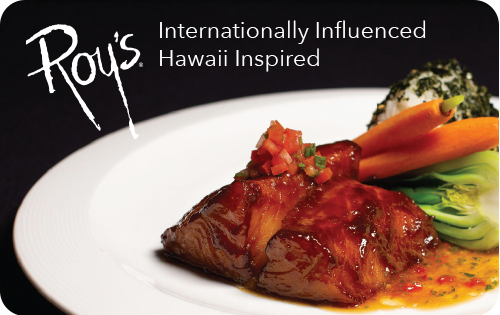 Gift Cards purchased on our site or restaurants may be redeemed at any Roy’s location in the continental United States, excluding Pebble Beach. This excludes locations in Hawaii, Japan and Guam. Do your gift cards expire or have fees? No. Our gift cards never expire. There are no fees for carrying the balance until fully redeemed. Check balance by calling 855-280-9568. No. At this time you are not able to order a gift card online and pick it up at one of our restaurants. You would have to visit the restaurant to purchase the gift card. Do the gift cards need to be activated? No, gift cards are delivered active and ready to use. Am I able to reload value onto my existing gift card? At this time, we are unable to add additional value to an existing gift card. How soon do I receive my E-Gift Card order? E-Gift cards are emailed after the completion of the activation process usually within 24 hours. How do I receive my bonus card(s)? Bonus cards are mailed via USPS. Please refer to the promotions tab for full bonus program details. Simply print off your E-Gift card and present it to your server for redemption. The value will remain on the E-Gift card until it is fully redeemed. Are E-Gift Cards accepted at all Roy’s? E-Gift cards are redeemable at participating Roy’s locations in the Continental United States only (excluding Pebble Beach). These E-Gift cards are not redeemable in Hawaii, Guam & Japan. What to do if I do not receive my E-Gift Card? Please contact our gift card representative at 214-616-5775. When will gift cards ship? Orders are PROCESSED within three business days, and shipping time takes an additional 4-5 business days. Bonus cards ship separately from gift cards and e-gift cards via USPS. Orders placed Standard shipping after 12/16 are not guaranteed to arrive prior to 12/25. No, we do not deliver on Saturday or Sunday. Can you deliver to APO addresses, PO boxes, Hawaii or Alaska? Yes, only via Standard Delivery. Guest Services at 214-616-5775 or email roysguestservices@roysrestaurant.com. On the same business day call 214-616-5775 to make changes. No, gift cards cannot be refunded. How does the Bonus Card promotion work? Between November 9th and December 31st, 2018, for every $100 in gift cards or e-gift cards purchased you will qualify to receive a $30 bonus card. Bonus cards are redeemable January 1st, 2019 to February 12th, 2019, one per visit and cannot be combined with other promotions. Bonus cards are not valid for use in the bar during Aloha Hours. Valid at participating mainland locations. When your order equates to $100 (i.e. 1-$100, 2-$50 gift cards, 4-$25 gift cards, etc) you will receive a bonus card. For example, if your order equates to $250 you will receive two $30 bonus cards. How will I receive my bonus card? Bonus cards are PROCESSED within three business days, and shipping time takes an additional 4-5 business days.Bonus cards ship separately from gift cards and e-gift cards via USPS. Can I use my bonus card with my gift card? Bonus cards may be combined with gift cards for payment at Roy’s Restaurant. Note, only one bonus card per table per visit may be used at one time. Can I add the $30 bonus card to my gift card amount? The bonus card is not a gift card and does not have a cash value. Buy more, save more. Enjoy added savings with gift card purchases of $500 or more. Bulk discounts cannot be combined with other offers or promotions (cannot be combined with Bonus Card offer). How do I order my bulk order? For questions or to place your order please call 214-616-5775. Please allow 3 business days to process your order. Discounts are offered for purchases of $500 or more. For Gift Card inquiries, please call 214-616-5775, Monday – Friday from 7am to 4pm PST. Only U.S. bank credit cards are accepted.